Have you ever gone through the agony of losing your cell phone? That has really yet to happen to me. It’s a good thing that I take care of my stuff. Well for a lost phone finder you need a website that was built dedicated to finding your missing phone. I introduce to you Where’s My Cellphone. When I first arrived at the website I was expecting something real extravagant and complex, but what I saw was a really simple website. What you do is enter your phone number with your country code (the U.S.is 1) and tell the website to call your phone. After a few seconds your phone should ring and a machine on the other end gives you a message. That’s it. UPDATED (2012): Of course if you have a smart phone there are better solutions. For Android you have Lookout. It’s a security app that safe guards your phone from viruses and tracks down your phone if you happen to lose it. 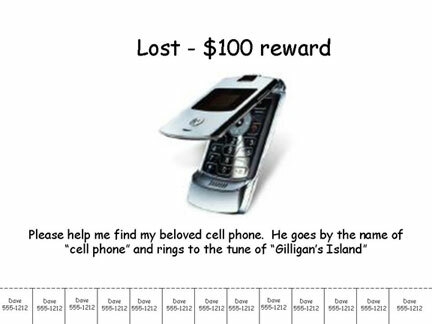 You can also make the phone scream if you misplaced it near by. As for iOS, Apple has released Find My iPhone. You can track down your iPod touch, iPhone, or iPad, make it scream, lock it remotely wipe your data from it. Of course, there are multiple apps available across many platforms. You just need to find the one that suits you. NOTE: The service mentioned above is useful for feature phones or very basic prepaid phones. I highly suggest that if you have a smartphone you find a tracking app that fits your needs and your mobile operating system. Next Next post: Can Multiple Monitors Increase Productivity?